‘The only games which are sanctioned or, more correctly speaking, “winked at” in the House of Commons are chess and backgammon. 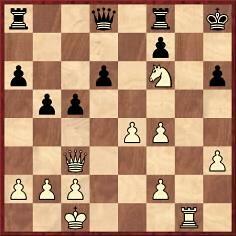 Chess, as the more stately and scientific of these, commands exclusive attention. Backgammon is, by common consent, voted bourgeois, and is tabooed. The chessplayers of distinction, that is to say, those who play upon scientific principles, are Mr George Newnes (who, according to Mr Henniker-Heaton, is the best player in the House), Colonel Nolan, Lord Carmarthen, Mr Bonsor, Mr Bromley Davenport, the Hon. Frank Parker, Mr Bryn Roberts, the Hon. W. Fellowes, and Mr Caleb Wright. As a time-player Mr Henniker-Heaton is the doyen of the Parliamentary chessplayers. When Mr Charles Bradlaugh sat under the fane of St Stephen’s he and the member for Canterbury pitted themselves together. Bradlaugh was a fine strategist, and the two were about equal. It was the cynical humour, however, of the member for Northampton, to take Mr Henniker-Heaton’s bishop, he being a churchman of the most orthodox type, and Mr Bradlaugh not sharing his opponent’s affection for the establishment. The House of Commons was represented by ‘Hon. Horace Plunkett, Mr Parnell, Mr Strauss, Mr Atherley-Jones QC, Mr Cosmo Bonser, Mr Seton-Kerr, Mr McKenna’. 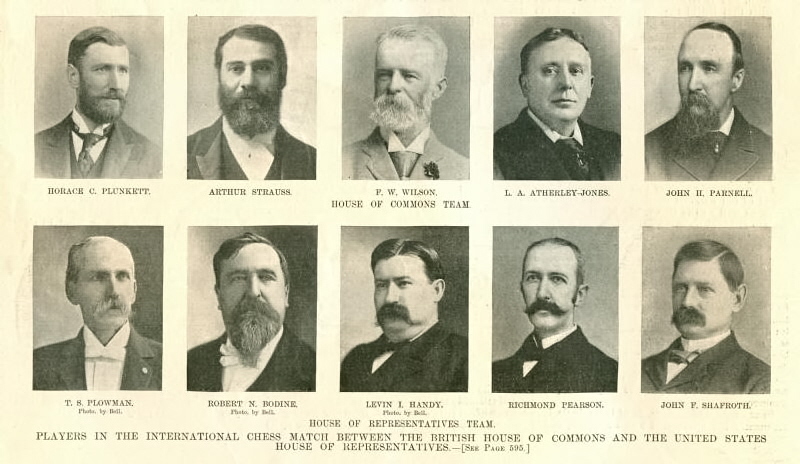 The following year (BCM, September 1898, page 369) the House of Commons beat the Press Gallery by 12½-9½. 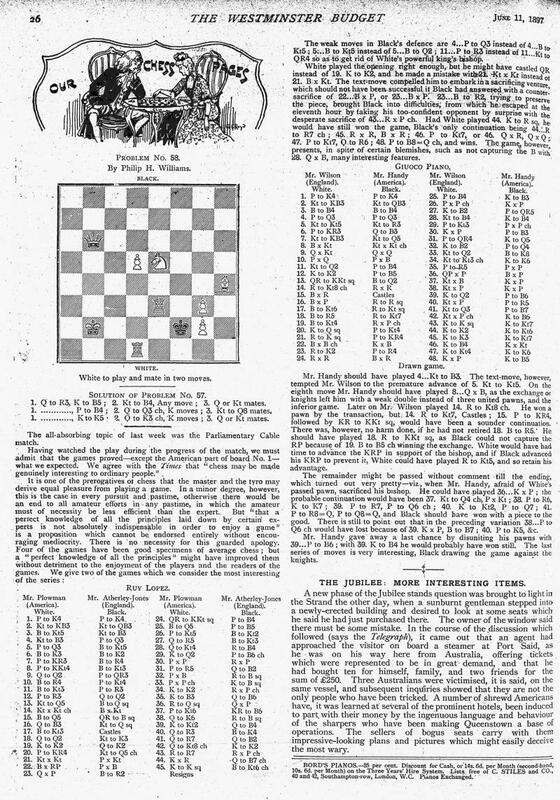 Page 143 of the August 1897 American Chess Magazine gave a photograph of Henniker-Heaton with a reference to, and brief quote from, his article on the cable match in the Pall Mall Gazette. Chess in the House of Commons Gallery used formerly to be played in the smoking room, but since last autumn, when fresh accommodation was given to the journalists, who were getting rather straitened in their old quarters, a small but comfortable room has been assigned to chess. It is high up in the building, looking out upon Palace Yard through a window fashioned with delicate tracery. Newly and admirably furnished, it does every credit to the First Commissioner. Is he a chessplayer himself? Perhaps. 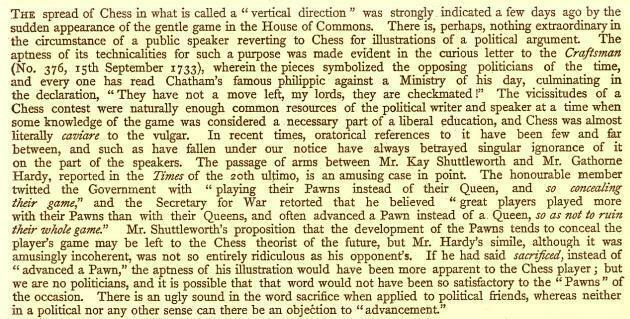 ‘Chess in Parliament has always been as much exaggerated, almost, as the story of Mark Twain’s death, thanks to the descriptive writer of the popular magazine, who never minimizes the importance of his subject, lest the editor should return his “copy”. 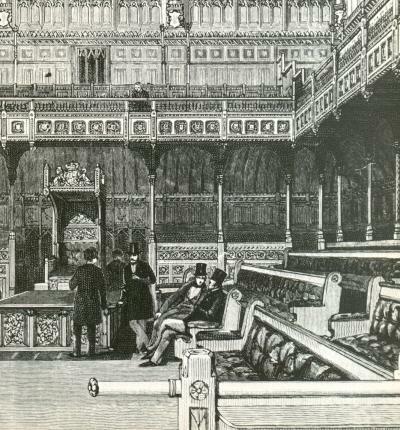 The amount of chess enthusiasm among MPs may be gauged from the fact that although there are two cups for inter-parliamentary contests on view in the smoking-room, one has never been played for, and the other only once some years ago, when a match with the American Legislature ended in a draw. The Parliamentary championship only exists in the fertile imagination of the lobbyist, and for the last three years even the match which used to be played with the gentlemen of the Press has been discontinued. 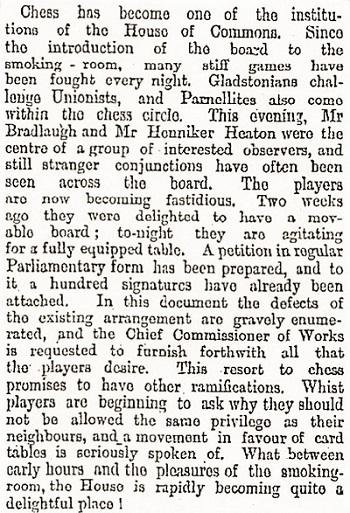 Shortly after the Great War, the Commons lost much of its chess presence. Page 44 of the February 1919 BCM cited an MP as writing in the Daily Dispatch, ‘The General Election has swept away most of the habitués of the chess-room in the House of Commons’, although he added that ‘the three greatest players, Mr Bonar Law, Sir Watson Rutherford and Captain Barnett, will be found there’. The same page of the BCM mentioned William Clough of the Bradford Chess Club, the former MP for Skipton. Later that year he was to win a 24-move game against Capablanca in a simultaneous exhibition. We gave the score on page 56 of the 5/1987 New in Chess, taken from page 5 of the Yorkshire Observer of 8 October 1919. Concerning the resultant exchanges on the floor of the House, see Andrew Bonar Law and Chess. It may be recalled that a game on 29 December 1919 between Capablanca and three Members of Parliament, including Bonar Law, was given on pages 59-61 of Chess and its Stars by B. Harley (Leeds, 1936) and pages 113-114 of The Unknown Capablanca. Neither book suggested that the game was played in the House of Commons, but this conclusion was wrongly drawn by R. Caparrós in the two editions of his book of Capablanca’s games. He also gave the score out of chronological sequence, placing it among the 2 December games despite correctly dating it 29 December. Another such match took place on 2 March 1933, when an eight-man team from Cambridge University visited the House of Commons and won +6 –0 =2. Sir John Simon lost again, and we gave the game in our feature article on him. The full result appeared on page 172 of the April 1933 BCM. At least to modern eyes, the event lacked star names, the US players being Richmond Pearson (North Carolina), T.S. Plowman (Alabama), Robert N. Bodine (Missouri), Levin I. Handy (Delaware) and John F. Shafroth (Colorado), while Great Britain was represented by Horace C. Plunkett, Arthur Strauss, F.W. Wilson, L.A. Atherley-Jones and John H. Parnell. ‘As to chess, somewhere about 1885 I discovered a solitary and decidedly ancient board in the Smoke-room of the House of Commons. It is alleged that there were legislators in the bygone days of the misty past who affected the game, just as it is alleged that a rubber of whist was often played in the rooms of a certain popular Serjeant-at-Arms, whither Members, who were carefully “selected”, brought their own whisky. As far as I can ascertain, however, there is only one survivor of those very exclusive whist parties. 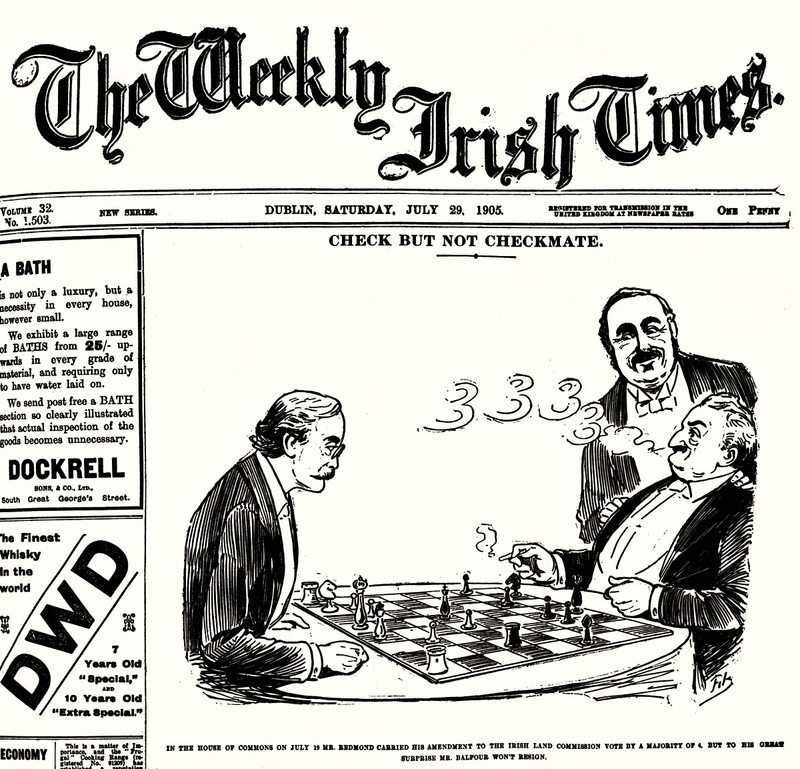 One full game and three positions (none of them particularly colourful) from the transatlantic cable match were presented in the detailed report on pages 1-6 of the American Chess Magazine, June 1897. 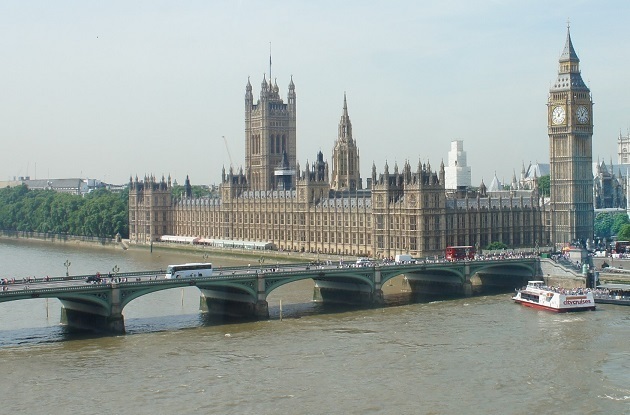 ‘When the structural and decorative alterations in the House of Commons were planned it was proposed to move the chess room. But the Commons chessplayers, headed by Sir John Simon, are a resolute and influential body; they insisted that their new room should remain close to the dining-room and smoke-room and it is so. The dining-room accommodation has even been reduced a little to oblige the chessplayers, whose room is now beautiful and attractive. The episode (which occurred in 1872) received 20 lines on page 300 of the October 1888 International Chess Magazine, courtesy of the Manchester Evening News. 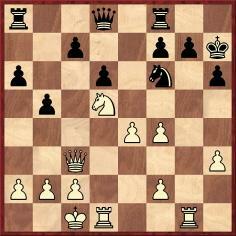 23 Rg7 Kxg7 and White mates in three moves. 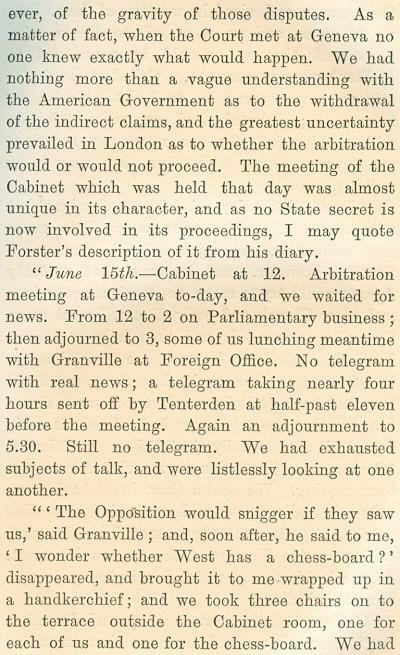 Page 290 of the August 1882 BCM mentioned regarding Talbot’s political career that he was ‘the only member who dates from the unreformed Parliament’. The game against Cattley was also given on page 281 of the July 1898 BCM (with the artistic enhancement 22...b4). There was a detailed report on pages 253-254 of the June 1927 BCM. So far we have found no apposite pictures of either the Prime Minister (Stanley Baldwin) or the Duke of York (the future King George VI). Source: BCM, January 1926, page 2. 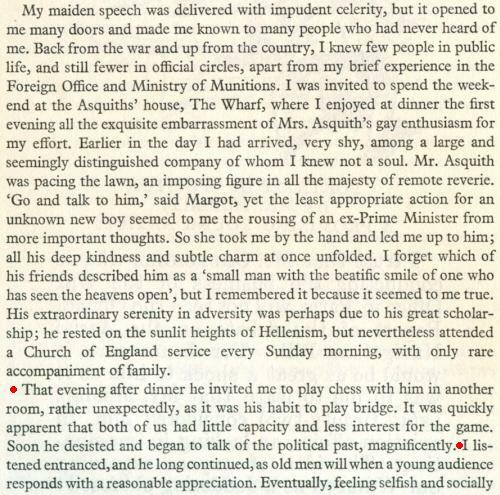 Books by Philip Gibbs (1877-1962) have a few references to chess, including the passage shown below from page 286 of one of his autobiographical volumes, The Pageant of the Years (London, 1946). The section in question, ‘Crossing the Atlantic’ (pages 284-286), also related his meetings with Maxine (Blossom) Forbes-Robertson, John Galsworthy, Myra Hess, Ernest Shackleton and Clare Sheridan. It gave no dates, but on page 267 Gibbs mentioned that he crossed the Atlantic in 1919, 1920 and 1921. As clarified on pages 359-360, David Davies (1880-1944) was later Lord Davies. Other references to his interest in chess will be appreciated. Concerning a match between Oxford/Cambridge and the House of Commons on 24 March 1914, see our feature article on Andrew Bonar Law. A feature entitled ‘House of Commons Tournament’ was published in Womanhood, 1902, page 209. It gave the conclusion of a game between Atherley-Jones and McKenna. Latest update: 12 April 2019.